There were several Hy-Tone labels, this discography is about the Hy-Tone label from California, although in the 1970’s it operated from Dallas, TX. The Texas 45’s were released in the 300 and 400 series, but Hytone 371 (note the alternative spelling) shows one of the California addresses (13515 Van Nuys Blvd.). The exact years of release are unknown, but it seems that most Californian 45’s were released in the mid 1960’s. There were at least three Californian addresses for this Hy-Tone label: 1190 Browning Boulevard – Los Angeles, 1149 S. Highland Ave – Los Angeles, 13515 Van Nuys Blvd – Pacoima. Hy-Tone 108 (Melody Kings) has been released twice, featuring the same songs, but one version features live recordings, the other studio recordings. There are no differences in the labels. Proverb was in a way connected to Hy-Tone, check the Proverb discography for more details. 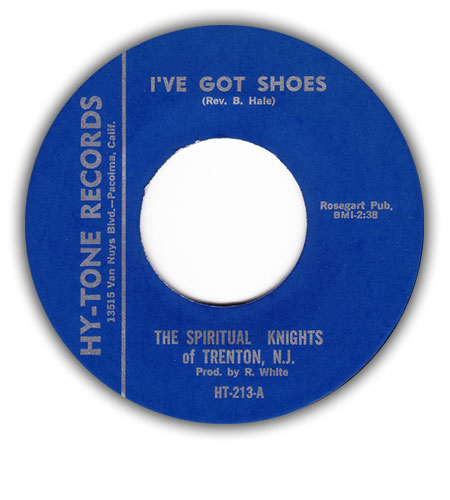 This page lists all known Hy-Tone gospel releases (45’s and one LP). 31 Hy Tone 303 Original Birds I Know I’m A Child Of God b/w Going To The City 197? 32 Hy-Tone 307 Golden Hummingbirds Golden Hummingbirds of Birmingham, Ala. By The Grace Of God b/w Blessed Quietness 197? 33 Hytone 371 Snead, Rev. Willie T. Rev. W.T. Sneed To Be Like Jesus b/w Move Up A Little Higher 197? 34 Hy-Tone 401 Traveling Souls Traveling Souls of Dallas Texas Farther Along b/w God Is Getting Tired 197? 35 Hy-Tone 402 Birds of Wonder Where Could I Go b/w God Will Answer Prayer 197? 36 Hy-Tone 403 Goss and Sunny South Singers, Jasper No No Nothing Can Change b/w Farther Along 197? 37 Hy-Tone (nn) Golden Hummingbirds Golden Hummingbirds of Birmingham, Ala. When I Reach The City Called Glory b/w When The Saints Go Marching In ? 38 Hy-Tone (nn) Golden Hummingbirds Golden Hummingbirds of Birmingham, Ala. Amen b/w I Need The Lord ? 39 Hy-Tone (?) Daniels, Rev. Wilbert Leo Rev. Leo Daniels (?) Viet-Nam b/w Few More Tears ? 40 Hy-Tone (?) Unity Travelers Somebody Bigger Than You And I b/w Good-By ? 1 Hy-Tone LP 100 New Hope Missionary Baptist Church Choir Let's Praise The Lord 197?